Citation Information: JCI Insight. 2018;3(12):e99976. https://doi.org/10.1172/jci.insight.99976. RNA editing gene ADAR1 is deregulated along with AZIN1 RNA editing levels in CRC. 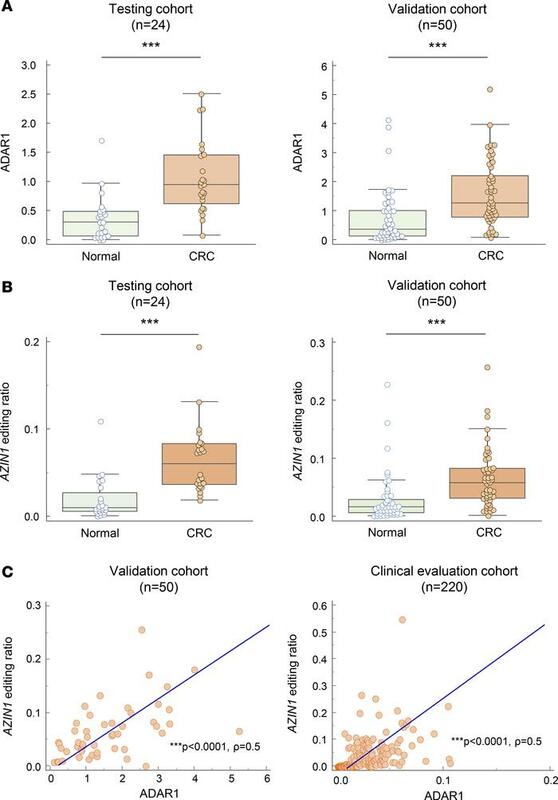 (A) ADAR1 expression levels in CRC tissues compared with that in normal mucosa in the training cohort and validation cohort (Wilcoxon’s signed-rank test). (B) AZIN1 RNA editing levels in CRC tissues compared to that of normal mucosa in the training cohort and validation cohort (Wilcoxon’s signed-rank test). (C) Correlation between AZIN1 RNA editing and ADAR1 expression levels in the validation cohort and the clinical evaluation cohort (Spearman’s rank correlation analysis). ***P < 0.001.